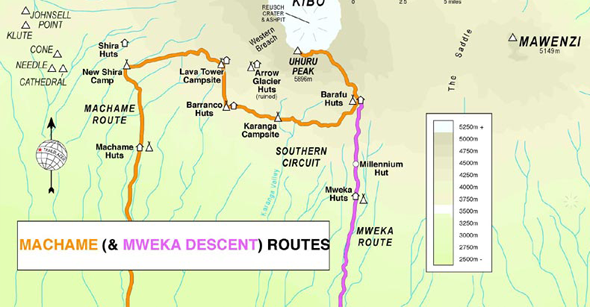 This is probably the most beautiful route up Kilimanjaro as it is very scenic. You get to see a range of stunning scenes from late afternoon sunsets at Shira to the misty revelations of Kibo at the great Barranco Walland. All your equipment and supplies are portered and a cook prepares your meals. The accommodation on the Machame route is camping in tents. The Machame route can be completed in 5 days. On day 3 on the itinerary below, you go directly to Kibo with an overnight at the Arrow Glacier camp, with your final summating attempt on day 4. This is an extremely physically and mentally demanding option, not recommended for the average climber. The route up to Lava Tower will take you about 5 hours. You will have lunch on the way before ascending the rocky scree path to Lava Tower (4630m). The descent to Barranco camp takes about 2 hours and there are many great opportunities to take some beautiful photographs of the Western Breach and Breach Wall. The camp is situated in a valley below the Breach and Great Barranco Wall, which means you will get to see the sunset while you wait for dinner. On the Summit day you will rise around 23h30, and after some tea and biscuits you will set off into the night. You will head in a northwesterly direction and ascend through heavy scree towards Stella Point on the crater rim. This 6 hour walk to Stella point is for many climbers, mentally and physically the most challenging part of the route. At Stella Point you will stop for a short rest and will be rewarded with the most magnificent sunrise you are ever likely to see (weather permitting). From Stella Point you will normally encounter snow all the way on your 2 hour ascent to Uhuru Peak. The time you will spend on the summit will depend on the weather conditions. Do not stop here for too long, as it will be extremely difficult to get going again due to cold and fatigue. The walk back to Barafu from the summit, takes about 3 hours. Here you will have a well earned but short rest and collect the rest of your gear, before heading down to Mweka hut (3100m). On the last day you will have a 3-hour scenic hike back to the Park gate. At Mweka gate you sign your name and details in a register. This is where successful climbers receive their summit certificates. Those climbers who reached Stella Point (5685m) are issued with green certificates and those who reached Uhuru Peak (5895m) receive gold certificates. From the Mweka Gate you will continue down into the Mweka village, normally a muddy 3 km (1 hour) hike. In the Mweka village you will be served a delicious hot lunch before the drive back to Arusha for a long overdue hot shower, dinner and drinks. The above tour includes: Park Fees, Transfers to and from the Airport, Breakfast, Lunch and Dinner whilst on the mountain, 2 nights at the Medium Hotel in Arusha/Moshi. Groups of 3+ qualify for a discount. Please contact for further information.